Although winter is creeping in on us, it will be back to summer in no time, and therefore we are already presenting you with some pool inspiration. Our focus is gardens and courtyards with a pool which have gone an extraordinary transformation. Whether large or small, swimming pool or Jacuzzi—a pool boosts the value of any home, bringing fun, refreshment, and thus ensuring that you can enjoy the summer even more. The pools, which we will show you today, have all seen their best days already and we can see the necessity behind urgent transformations. Therefore, we present five renovation projects around the swimming pool. From ailing, old and dirty pools, the experienced hands of our pool experts created oases of relaxation. Curious? Then waste no time in checking out our list! After the renovation of the pool area, it is unrecognizable. Here is an inviting clean, tidy and bright space on the floor, which was previously dirty and unevenly tiled. 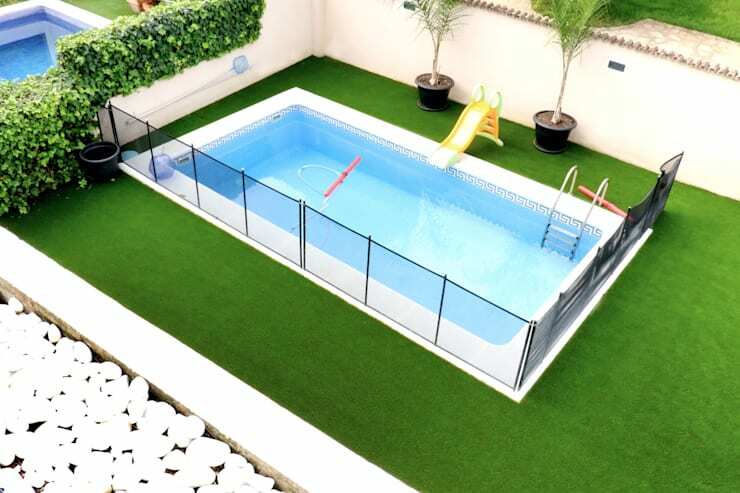 Our experts have laid a strong green artificial turf, which brings a lot of colour into the garden. The messy environment was worked up and separated from the garden area with white stones. The fence was also renewed and some decorative elements were brought in. Two potted trees bring a natural atmosphere to the area. The pool itself was not only thoroughly cleaned, but also provided with a small slide and a new ladder. The result is amazing and shows that you do not necessarily need a big budget for such a renovation. Simply with good planning and a few creative ideas, much is achieved! If you love the idea of a pool, but are wary of the cost involved, take a look at our ideabook on the: Real costs involved in building a swimming pool. 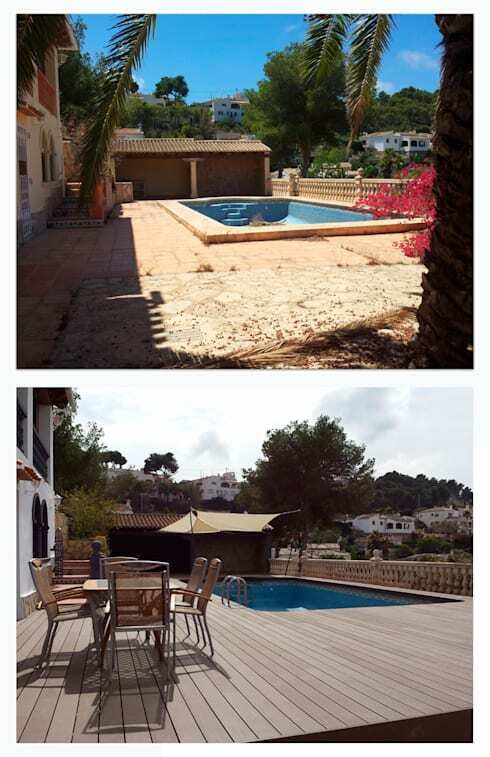 Our renovation project number 2 is also found in Spain. 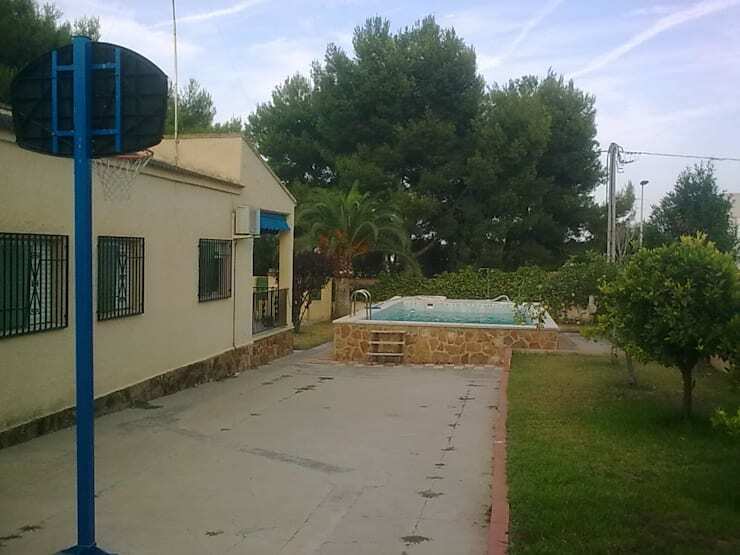 The large house was built in the 1970s and has a promising pool area, although it has been neglected for years. The pool is big and tall, the outer walls paved in stone. The garden itself has many beautiful trees and palms which exude a tropical atmosphere. This is just right for a beautiful outdoor area made for refreshment and relaxation. The main problem with this object was clearly a lack of care and maintenance, which now cost the experts some work. But the result is quite impressive! After the renovation of the exterior, the pool is clean, bright, and colourful. The biggest changes were made to the terrace, which includes a new, small stone wall, and the addition of a steep pitched roof, which protects against wind and rain. A complete overhaul has also taken place on the ground. The once damaged cement has been completely replaced by fine, bright tiles. The different areas and flower beds of the garden are now divided by Mediterranean stone walls. Again, this element is used to delimit the entire exterior of the street. The garden itself is now planted with many flowers, trees and palms and acts as a green oasis of relaxation. The pool itself has taken on a new light—it has been extended on one side, and next to it the floor had been filled, so that the edge of the pool can be reached at ground level without climbing stairs. 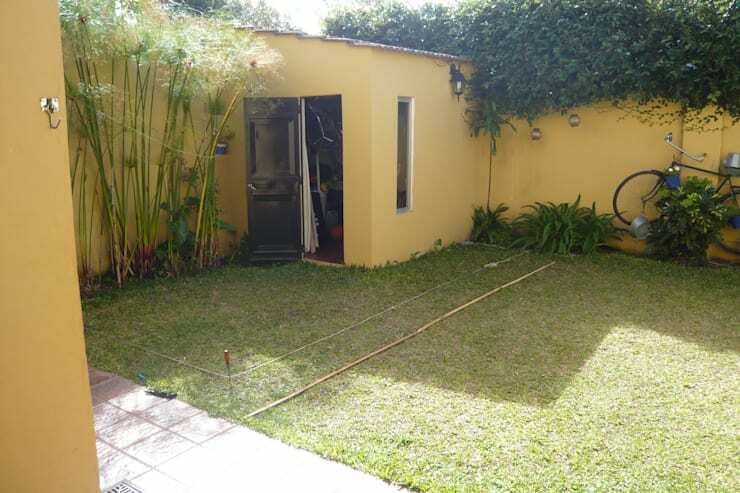 With this number we will see the largest before and after transformation, since the original image shows a small but somewhat boring outside area without pool or bathing spot, from which one certainly could get more. 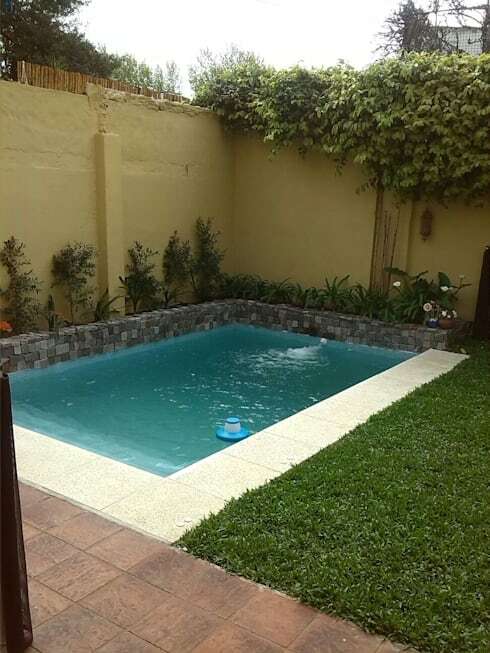 While the flowers and green areas are well maintained and in good condition, there is still considerable room for improvement—such as a small private pool, which offers refreshment on hot afternoons. After: From the cool water! After the transformation we discover the garden as a real gem! 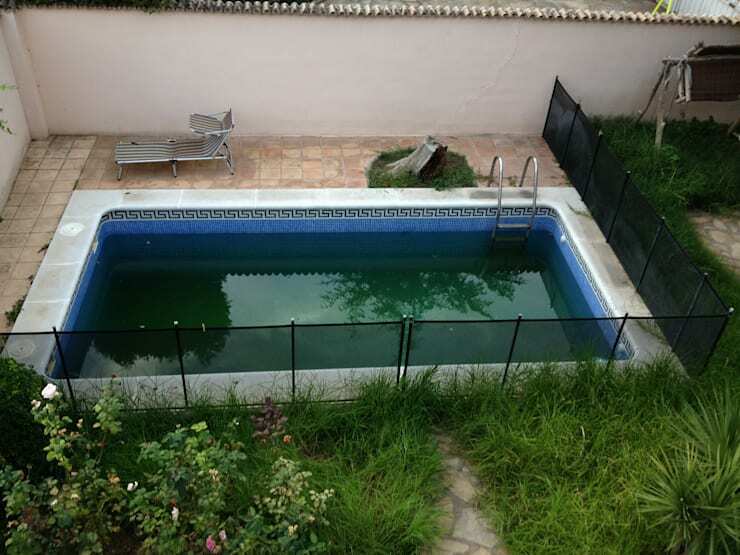 The small gazebo in the corner has been removed to make room for this wonderful pool with its not so small at a size of 5 x 3 meters. The design of the object is restrained and functional. Free space to play for the children and for gardening, grilling or sunbathing for the parents was deliberately planned here. Beautiful accents are created by the stone wall with its green shade on the pool. 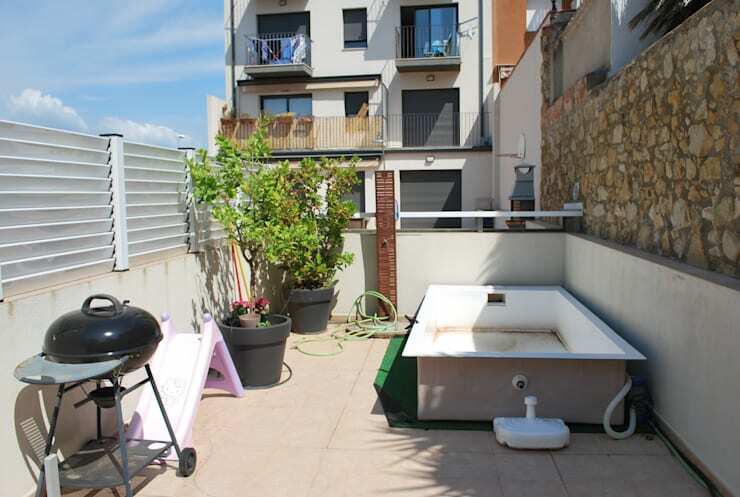 This before image is anything but inviting: The terrace is messy, dirty and neglected, and the empty pool is not nearly representative of the desired attributes of such a feature. The complete area looks drab, colourless and poorly suited to spending hours of relaxation. In addition, the area is very small, seeming overloaded and cramped. All the more surprising is the impressive result. It just goes to show what can be created with experience and creativity! No nuance is more suitable to reflect light and exude freshness than white! Our result-image impressively proves how optic variability can be obtained through the use of bright white. The previously small and cluttered area is now open, generous and radiant. All the useless objects standing around were removed, creating a nice sunbathing area. 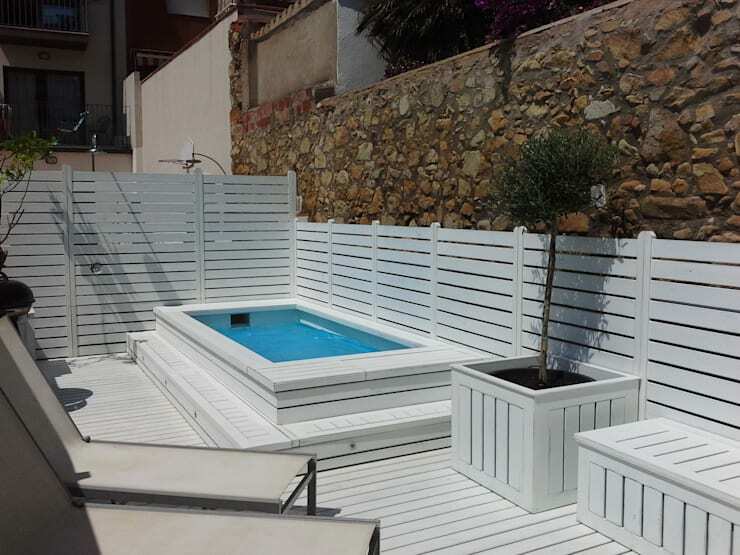 Fencing, floorboards and planters act as a unified whole made of white, lacquered wood slats. The swimming area was also lined with white bars that facilitate by their gradation as a sort of stairs to enter into the cool water. The experts have completely reorganised the space by shifting the barbecue, which can be seen at the left edge of the image. Here are also a couple of chairs and a white wooden bench that invite you to linger. So a place has been created which is ideal but is also suitable for small barbecues or just to sit together for swimming and sunbathing. In the last project that we would like to present to you, we can directly compare their initial position and earnings. Here it was less about turning an eyesore into the jewel of the property, but rather a stylistic renewal. Even in his state before this pool area was quite appealing, albeit in a very traditional and a little old-fashioned style. As part of a large villa in Spain, it scored with a covered patio, plenty of free space and some plants and trees. Nevertheless, our architecture experts have decided on a comprehensive makeover. The result: A purist, simple pool area with design character which nevertheless maintained some of the traditional Spanish architectural components and thus connects tradition with modernity. Most of the area was covered with natural-coloured wooden planks that were optically matched to the other new elements. New equipment was received with a sitting area and a niche for barbecues on the terrace, where the expansive space can now be used much better. The pool was thoroughly cleaned and now owns a ladder for safe access and egress. A sure improvement! Which of these pool transformations did you like best and why?